Passionate about accelerating the future of startups and transportation, David C. Murphy is Founder & CEO of TechFire, which Techmeme recognized in their list of nationally and internationally significant tech conferences. 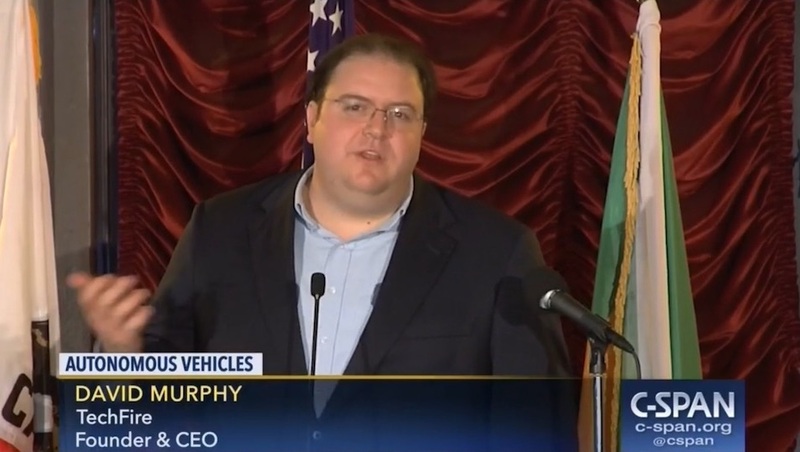 TechFire has hosted more than 30 events since 2013, including a Summit on the Self-Driving Car Revolution that aired on national TV on C-SPAN. TechFire has hosted many of the nation's most prominent startup founders and venture capitalists, such as about.me's Tony Conrad HotelTonight's Sam Shank, Aurora Innovation's Chris Urmson (former head of the Google Self-Driving Car Project), Greylock's Josh Elman, Techstars & Foundry Group's Brad Feld, among many many others. TechFire's events have attracted more than 6000 registrants, as well as Fortune 500 and industry-leading sponsors such as Wilson Sonsini Goodrich & Rosati, Deloitte, EY, CBRE, and consulting clients like the City of Burbank. David's is a serial entrepreneur focusing on tech, media, & social entrepreneurial ventures. He previously founded Angelenos Against Gridlock, raising funding from Elon Musk, David Bohnett, Google, Uber, and Lyft. David's work led to coverage on the front page of the Los Angeles Times, and on Good Morning America, Bloomberg, The Telegraph (UK), Business Insider, and beyond. In high school, David co-founded Hotline Communications, whose chat software attracted millions of users around the world and corporate users like Apple and General Motors. David's career has also included stints working in Congress, at USAID (in Kiev, Ukraine), and Space Adventures (the space tourism startup that sent the world's first space tourist to the International Space Station). A native of the Washington, DC area, David has also lived in Bulgaria and Kenya, and spent extensive time in China as the recipient of the Avery-Durfee China Fellowship. David is a graduate of Claremont McKenna College (CMC), and former President of its Los Angeles alumni chapter. It was as a student at CMC that David first developed his love for hosting events, as one of two students hosting the 100+ speakers a year at the renowned Marian Miner Cook Athenaeum speakers series, where highlights of their thousands of speakers over the years include Bono, Bill Clinton, Mitt Romney, Thomas Friedman, and Desmond Tutu. Connect with David on Twitter at @DavidCMurphy or on LinkedIn, or email him at david@techfire.co.